HALIFAX, Nova Scotia (CNN) -- Grief-stricken families from Europe and the United States headed to Nova Scotia's rocky coast Friday to confront the chore of identifying remains retrieved from the ocean waters where Swissair Flight 111 crashed into fragments. Rescuers on Friday continued to cope with what one termed a "ghastly" scene as they pulled victims from the rough waters of the North Atlantic on Thursday. While Royal Canadian Mounted Police say the remains of about 60 people on board the doomed flight have been recovered, Commander Rick Town of the Canadian Navy said "it's not practical to speak of bodies when talking about the remains of the victims" because of their fragmented condition. "It's grisly, gruesome and ghastly," he said. While RCMP officials say they have not given up all hope of finding any survivors among the 229 people on board the doomed flight, chances of survival are "very poor," said Staff Sgt. Keith McGuire. Unless there are any new developments, the search for survivors will end early Friday morning. About 20 boats -- including fishing vessels, tour boats and Canadian Coast Guard and Navy craft -- and 10 planes searched the crash site, about 7 miles (11 kilometers) off the coast of the picturesque fishing village of Peggy's Cove. While personal belongings of passengers and small pieces of the aircraft were recovered, no large pieces of debris were brought ashore. However, searchers believe they might have located part of the plane's fuselage under about 115 feet (35 meters) of water. Search crews used sonar in an attempt to find the plane's "black boxes," which record flight data and the crew's cockpit conversation. On Friday, a submarine will be brought into the area to help in that search. Investigators and technical experts from Canada, the United States and Switzerland are converging on Nova Scotia, trying to determine why the Swissair MD-11 crashed while trying to make an emergency landing at the airport in Halifax Wednesday night, about 90 minutes after leaving Kennedy International Airport in New York, en route to Geneva. Details have emerged about the flight, indicating that the crew spent some time struggling with the malfunctioning aircraft. Passengers had apparently been prepared for an emergency landing, as some of the bodies recovered were wearing life jackets. Walter Vollenweider, a Swissair vice president, said the pilot, Urs Zimmermann, detected smoke inside the jet after leaving New York. He considered an emergency landing in Boston but opted for Halifax, which, by that time, was closer. Halifax International Airport received a call at 10:25 p.m. (9:25 p.m. EDT) from the pilot, announcing that he was dumping fuel in preparation for an emergency landing. He took the jet from 33,000 feet (10,000 meters) to less than 10,000 feet (3,000 meters). The pilots then issued the ultimate distress call -- "Pan. Pan. Pan." 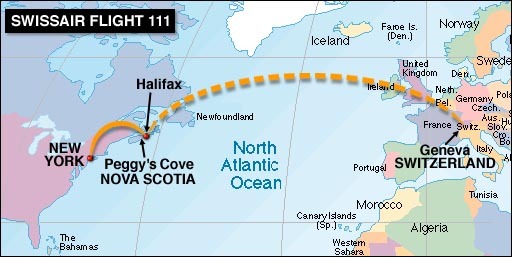 The plane disappeared from radar at 10:30 p.m., less than 10 minutes before it would have reached Halifax. Swissair on Friday revised its breakdown of the nationalities of the 214 passengers and 15 crew aboard the flight. The number of Americans on board was changed from 136 to 132, including one Delta Air Lines flight attendant. The company said 41 Swiss citizens were on board, including 13 Swissair crew members. In addition, the company said Friday, there were two Lebanese, one Indian, one Mexican and one Swede. On Thursday, Swissair noted that 30 passengers were French, six Britons, three Germans and two Greek. Other nationalities on board included one passenger from each of the following countries: Saudi Arabia, Yugoslavia, Afghanistan, Iran, Spain, St. Kitts and Russia. Swissair based its nationality estimates on the passports of the ticket holders. Fifty-three of the passengers had been sold their tickets by Delta Air Lines, an American carrier that has an agreement with Swissair to book passengers on each other's flights. Roy Bears, a Canadian aviation safety investigator, said the circumstances surrounding the crash point away from terrorism as a possible cause. "There were 16 minutes elapsed from the time they initially declared an urgent situation" until the jet was lost on radar, he said. "At this point ... the crew do not think they have anything that would indicate a terrorist act." 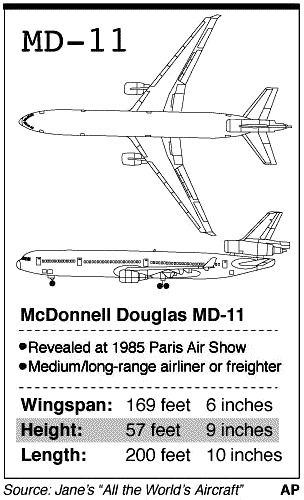 Canada's Southam newspaper group reported Friday that the Federal Aviation Administration issued a directive in 1996 about a wiring problem with the MD-11. The agency said the flaw could lead to a fire and impair the pilot's ability to control the aircraft if it was not corrected, according to the report. While U.S. airlines were required to fix the problem, the correction was optional for foreign carriers. Swissair set up command posts in New York and Geneva to help family members of the victims, and the airline offered the families "immediate compensation" of $20,000 per passenger. About a dozen grieving family members, clutching one another for support, silently filed through Halifax International Airport late Thursday afternoon. A Swissair spokesman said more than 100 more would be arriving Friday on a special flight from Geneva and Zurich, Switzerland, and others were coming from New York on a flight arranged by Swissair's partner, Delta Air Lines. The airline and Boeing Co., which now owns the jet's manufacturer, McDonnell-Douglas, were sending teams of experts to investigate the disaster. Air safety investigators from Canada and the United States were already on the scene. The doomed jet was put into service by Swissair in August 1991. Swissair said it will check the remaining MD-11s in its fleet and will bring them back into service only when the airline establishes that there are no technical problems with the planes. Correspondents Jim Clancy, Carl Rochelle and Bill Delaney and Reuters contributed to this report.